Young Bulls flanker Dewald Potgieter got himself in a whole lot of hot water against the Crusaders on Friday night in Pretoria. 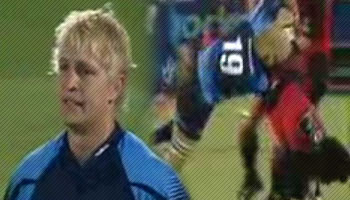 Potgieter has been suspended for a week after an outrageous spear tackle on Casey Laulala. As if the evening wasn't disastrous enough for the Bulls, who went down 54-19 in the end, Potgieter put a black mark next to his name and is now out for the next week. For some reason the ref and touchjudge didn't consider this bad enough to be a yellow card, but I guess that's what the citing commission is for. I personally thought it would have and could have been a red. It's a pity for the young Potgieter, who actually made a huge difference to the poor Bulls performance. I'd like to say you'll be hearing that name again in the future, but hopefully for different reasons as to why you're hearing it now. We've seen some terrible spear tackles in the past, but this is one of the worst, with Laulala actually flipping over so far that he didn't land directly on his head, luckily. A one week ban in my opinion is extremely lenient, but perhaps the players' disciplinary record and character was taken into account. Stupid tackle. Probably deserved at least a yellow. No place for it in the game these days. No place for it in the game at any point mate. Looking at it he was extremely lucky to play any further part in the game and not cause a serious injury. I think he realised straight away what he was doing and tried to correct it though. the only reason he never got booked is that the guy never landed on his head and so he never injured him seriously. well thats what i think anyway. The victim tried to ride the tackle instead of driving low and had his feet whipped out from underneath him. You could make the case that he intended to hurt him seriously if the guy actually drove him into the ground but he didn't and simply used his arms. This site is far too melodramatic. Ok so it was a bad tackle but it looks a lot worse than it is. Firstly he doesn't land badly so there's no harm done from that perspective. But secondly, it was clearly an accident. He goes in for a standard dump tackle but slips and spins him round by mistake. It ended up being a dangerous tackle but rugby is a dangerous sport. Get over it. Doyler8, that was in the Scotland-Ireland game, O'Driscoll got hit low and basically somersalted over the tacklers shoulder. It seems that the tackler was concentrating so much on bringing the player down gently, that he, himself, almost ended up headfirst into the ground. Rugbydump could you get some highlights of David Strettle up? I know his main attributes for the country is getting injured but he has had some truly magical moments against Wales this year and against France and Ireland in last year. Cheers. it doesn't matter how good or bad it was, or how ott people are being about it, there's no place for it in this game. you're right, if it was an injury there would be a big uproar, but because there wasn't it's okay. in that sense it is sport, because in some cases stuff like that ends up being nasty (e.g BOD injury). more to do with the tackled player than the tackler here, he's trying to writhe out of the tackle in mid air which is why the flanker can't dump him properly. Look guys, a spear tackle is a spear tackle regardless if he gets a broken neck or not. If you tackle someone and lift the player with them going down head first then it's a straight red. If there is more consistency with spear tackle offences then players will stop doing it. Hopefully before someone does get seriously injured because it’s bound to happen. You get yellow carded for throwing a punch, regardless if you break the guy's nose or not. How is this any different? It actually looks to me like he didn't intend to spear him at all. It looks a bit like his target started flipping a bit before he even got his arms around him. He might have driven him all the way over specifically NOT to hurt him. He seemed to know what he did afterwards.